Richard Jones (15) scored for Peterborough Sports at Romulus. Photo: James Richardson. 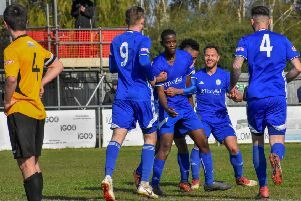 Peterborough Sports were denied a crucial win in their basement battle in Division One South of the Evo Stik League by a goal 10 minutes from time today (January 6). Central defender Richard Jones gave the city side the lead at Romulus in the crunch clash between the two teams who started the day in the bottom two with just 20 minutes remaining. But bottom club Romulus found an 80th minute equaliser to stay within two points of Sports. The city side did move up a place, but next-to-bottom Carlton have six games in hand! Stamford AFC bounced back from their shock defeat at Sports on New Year’s Day by battling to a terrific 1-0 success at Lincoln United. Eliot Putman claimed the only goal of the game for the Daniels midway through the second half. Stamford move up a place to sixth. Spalding’s scheduled fixture at Sheffield was postponed because of a waterlogged pitch. Postponed: Sheffield FC v Spalding Utd.